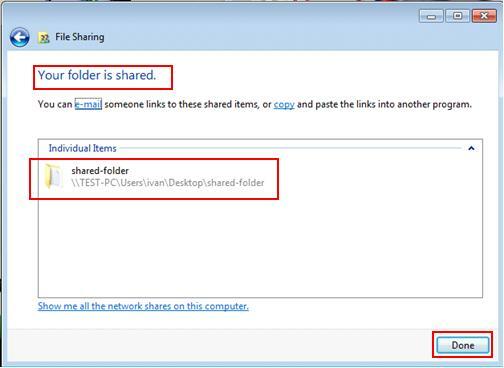 If you are not aware, password protected file sharing in Windows 7 is useful to only allow limited users to access shared file/folder after having successful username and password authentication. 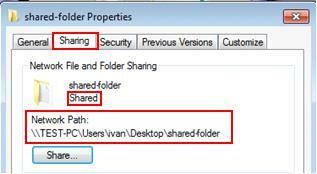 This is recommended file sharing method to avoid unauthorized file access. 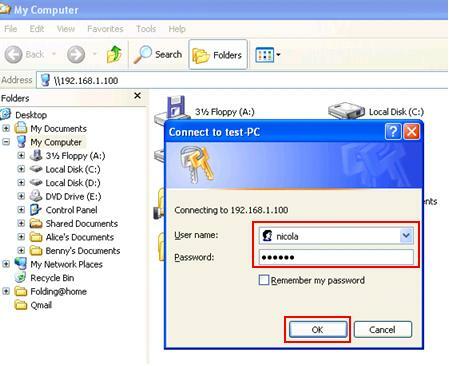 1) First you need to confirm that you have enabled file and printer sharing on network card. It’s easy to verify! Go to Start and click on Control Panel. Proceed to click View network status and tasks in Control Panel window. 2) Network and Sharing Center window will appear, after that click change adapter settings on left panel. 3) Network Connections window will appear. 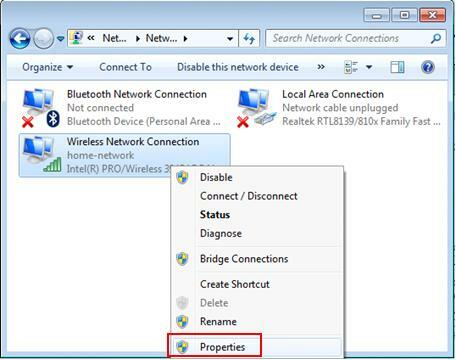 Here you can right click on the network adapter (can be wireless adapter or wired Ethernet adapter) that you are using and click Properties. 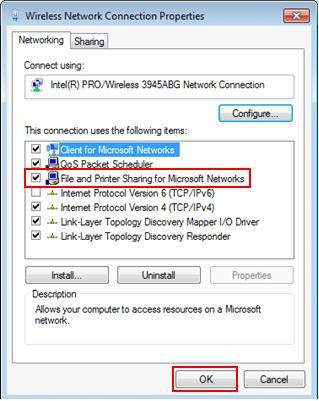 4) Your network card’s properties window will appear, then tick File and Printer Sharing for Microsoft Networks if it's not tick, finally click OK.
5) Let’s move back to Network and Sharing Center window, make sure you have selected the appropriate network location type before enabling file sharing, mostly home network or work network type. In this case, my network location type is home network. Note: I would also advise you to set the same Workgroup for all computers on the same network in order to ease the file sharing. Note: You are also advised to enable network discovery too, so your computer can discover and locate other computers easily. 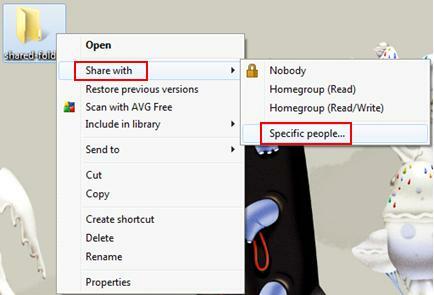 6) Now you can proceed to click on Change advanced sharing settings. 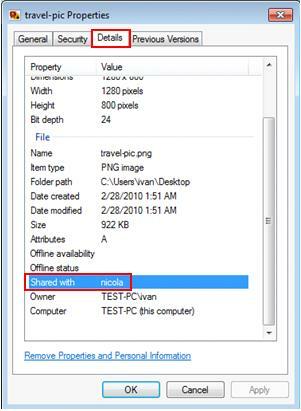 7) Here you need to locate your current set profile (home or network in this case), and turn on following settings to enable password protected file sharing in Windows 7. Click on Save changes at last. 9) File Sharing window will appear, and here you can select or key in the people you would like to share the file/folder with and click Add. In this example, I share this file with nicola only and also give her Read/Write permission. Finally click Share to do sharing. 10) The next window will tell you that your file/folder is shared, click Done to close the window. Basically you have done password protected file sharing in Windows 7. 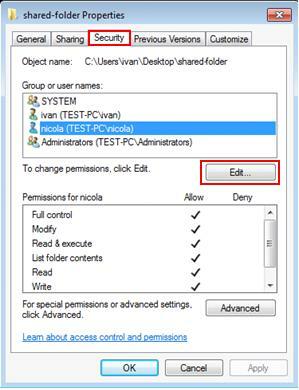 11) Finally, when Nicola tries to access this password protected shared folder from Vista, XP or other Windows OS, she will be prompted to key in username and password. Here she needs to key in user nicola and correct password to access this folder from other XP computer. Note: You will notice there is no change on the shared file/folder icon, but if you right click the shared folder and click on Properties. Then go to Sharing tab, it will show that folder is shared. Note: If you just shared a file (not folder), right click the file and click on Properties and go to Details tab, it will show you the users that the file shared with. Note: You should also click on Security tab. Check the group or user names that are allowed to access this file/folder, and make sure the user/group that you allowed to access during sharing process just now is listed here as well (usually will be added automatically when you do file/folder sharing), if not click Edit to add those missing user/group. 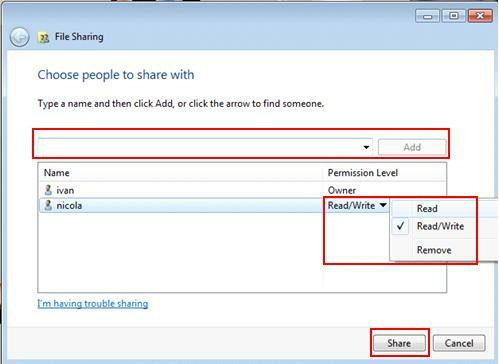 If the specific user/group you allowed during sharing process does not match the user/group listed here, the missing user might not be able to see that shared file/folder at all! Or the user will get prompt saying that you might not have permission to use this network resource when try to access this shared file/folder from other computer. Return to top of "Password Protected File Sharing in Windows 7"! !